1572 layers over the course of fifteen months. Yeah, let's start from the beginning. This image is something I found on Danbooru back in early January 2008. I thought it was an awesome image, and wanted it as a wallpaper. However, I have a widescreen monitor, and trying to stretch it out didn't look good, so I knew what my next project was going to be. I took my time with it, wanting to be as exact as possible. That went on until early March of 2009, when I had a hard drive crash and lost the file, meaning I had to start all over again from scratch. At that point, I decided to go full steam with the thing, and for three weeks I worked on this in my spare time. The entire thing is vector based, with some airbrushing and smudging. Being the OCD guy I am, I made layers for every smudge I decided to make as well as every time I used the airbrush, trying to stay as true to the original image as I possibly could. I took a few liberties and got a bit lazy on the chains (which were the hardest to do), but overall I'm very happy with it. In any event, download and enjoy. And leave me some feedback! This has taken up a ton of time after all. This wallpaer looks so beautiful. It's nice background and effect of item. You have much attempt. Good Job! One can definitely tell you spent A LOT of time working on this. It looks amazing. I'm a huge fan of the show, and I think you did an excellent job! i want to thank you for make a Fate Stay Night Wallpaper for widescreen resolution. I recently change my monitor and it's difficult to find wallies from some series in this resolution! And also, i love it! Great piece of work! But definitely, since you put in a lot of effort into it. Fatastic job! That looks really good. =D Great job on the effort because it looks spectacular. The color and everything is wonderful. Awsome job ^-^ thanks for taking the time to make it. Ridiculously awesome! Damn, I love UBW, and this wall definitely does it justice! omg too many layers, and a really good job, the colors are great, this really show how much effort took do this. Its a very nice wall! 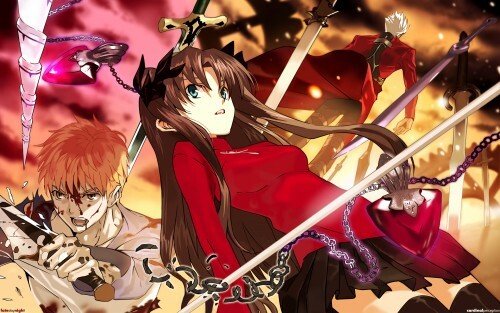 I would like it more, if tohsaka was alone... without O_O i forget his name.. XD tha carrot guy... but its very nice! excellent wall. u should be satisfied with the result. Wow.... awesome job, looks like the original.